Do you use a third party connector with your Apple device? Well, after the iOS 7 upgrade, your device might begin to warn you that your cable is not certified. And thanks to some safety concerns raised by researchers at Georgia Tech, Apple has introduced other security updates in iOS 7. Is your USB connector a genuine Apple certified one? If not, you might want to consider buying one soon. 3 Why is Apple restricting the use of third party lightning connectors? When Apple first introduced the lightning connector, multiple websites had reported about an Authentication Chip embedded in the lightning cable. This chip was allegedly developed by Apple to stop manufacturers from developing uncertified versions of their proprietary connector. However, some of the manufacturers have claimed to have successfully bypassed the authentication and have built connectors that work fine across all Apple devices. 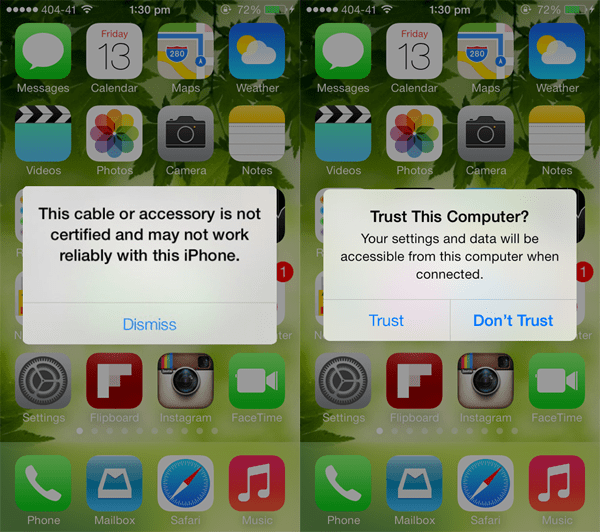 But on iOS 7 and iOS 8, some of these connectors have started to throw warnings. 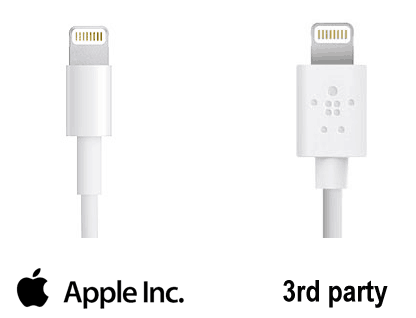 If you own one of these third party connectors, iOS 7/iOS 8 might warn you for using an uncertified cable. A lot of companies release docks for Apple devices. There is a fair chance that iOS 7 can detect uncertified accessories from these third party vendors that may have bypassed Apple’s authentication. They may have worked flawlessly in iOS 6; might throw warnings in iOS 7 and 8. This might be problematic for the manufacturers, as they might lose previous customers. In addition, they would need to get authorization from Apple (unless they intend to bypass the new authentication again). The new authentication system used in iOS 7 and above is capable to detect uncertified connectors, but still might let you charge your device at your own risk. Why is Apple restricting the use of third party lightning connectors? Unofficial and unauthorized USB connectors may damage your iPhone and other Apple devices, or even cause fatal accidents. Along with safety concerns, Apple may also be restricting unofficial vendors in order to improve their own product sales. With many of the third party accessories throwing warnings, people will be compelled to buy official Apple accessories. But there is high demand for lightning connectors from users anyway. Lightning cables can easily get damaged due to accidental bending and misuse. So less third party support would mean that Apple has to supply more, which is not a feasible option. Thus, safety of the device seems a more valid cause for Apple to restrict lightning connectors from untrusted vendors. Long story short, get an official lightning connector from one of the Apple Stores. If you can afford an 800 dollar phone, you should also be able to spend 20 dollars for a cable. Official Apple made cables are perfectly compatible with your Apple device. But if you are on a budget or official accessories are not currently in stock, we suggest you carefully pick your product. Some third party lightning cables still work with the devices running iOS 7 or later. They might be officially certified manufacturers, or they might have successfully replicated the connector flawlessly. Either way, if that is the case, those cables are compatible with your device. Most third party cables, however, are likely to show the warning message. When you go to a store to buy a third party lightning connector, ask them for a demo to test its compatibility. A notable fact here is that most of the working third party lightning cables are wider at the base than the original ones as it’s difficult for third party manufacturers to reproduce both Apple’s technology and design at the same time. The picture above shows an official lightning cable on the left, and a working third party lightning connector on the right. As you might notice, the third party connector has a broader base than the Apple connector. And as far as online booking is concerned, we wouldn’t recommend it. You might end up paying for some cable which is incompatible with your device. Many online stores are advertising cheap lightning connectors for sale. However, these products aren’t reliable and might not be compatible with Apple devices at all. Some products even have “iPhone, iPod and iPad” supported tags on it, but might display warnings in iOS 7 and iOS 8 powered devices. For the sake of being on the safe side, you should buy a lightning connector from official Apple Stores and resellers only. Researchers from Georgia Tech University demonstrated a fake charging dock which, when connected to an iPhone running the “latest version” of iOS, injected a virus into the phone. The virus was capable of automating multiple tasks like simulating touches, making calls, replacing apps with their fake versions, etc. without any human interaction – all in spite of the highly restricted iOS ecosystem. The fake dock was actually a computer disguised as a charging station that was capable of injecting software into the phone. The virus does not require the device to be jailbroken. On iOS 7, Apple has taken care of this vulnerability. Every time you connect your Apple device with a computer, a message pops up asking you to “Trust the currently connected computer”. Hence, no external device / program will be able to make changes to your iDevice unless it is trusted by the user, an act which requires manual intervention.